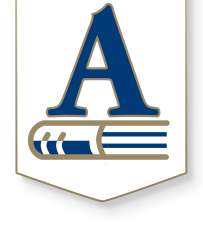 Andover voters approved $188 million in bond-funded construction projects in May 2017. Here is an update on current and future projects. 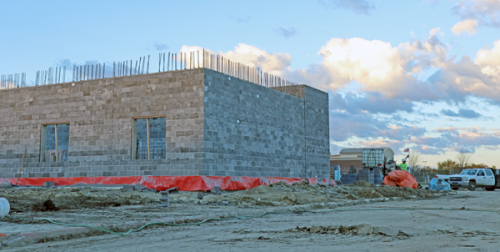 Construction on additions at Andover Central High School began in August. Masonry work is well under way on one addition on the front of the building (pictured below), while it will begin soon on the other addition on the front. Overall, the ACHS project includes science labs, a multipurpose room, orchestra room, small engines lab, controlled access to the main entry and remodeling inside the current facility. It also will include a FEMA-rated storm shelter. The project is scheduled to be complete during the summer of 2019. When planning for our bond projects began, the new stadium, district tennis complex and related athletics facilities near Andover Central High School were scheduled to be completed by fall 2020. During the planning process, district leaders and bond partners determined that the timing could be moved up, to be completed in fall 2019. However, it has taken longer than expected to receive required environmental approvals necessary to construct these projects on the new timeline. Therefore, district leaders and bond partners have decided to return to the original timeline for these projects. We are working closely with the U.S. Army Corps of Engineers, the City of Andover and our full bond construction team to resolve environmental concerns that were not revealed to the district prior to setting the 2019 timeline. Construction is now set to begin in fall 2019, after the middle school football season, with completion before sports begin in the fall of 2020. While we understand this may be disappointing to some athletes hoping to use the new facilities starting next year, this change will ensure the project doesn’t interfere with athletics schedules and is done in the most budget-efficient manner possible. Construction began in late October on the new Andover High School, to be located just east (or behind) the current school. The new building will replace most of the deteriorating current AHS facility. It will include flexible, 21st-century learning environments, and improve safety and security. Existing low, dark corridors and classrooms will be replaced by multi-level, open spaces with plenty of daylight. Groundwork and grading will take several months to complete before construction begins on the actual structure. 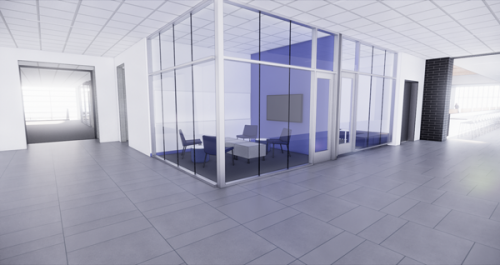 Rendering of collaborative space at the new Andover High School. 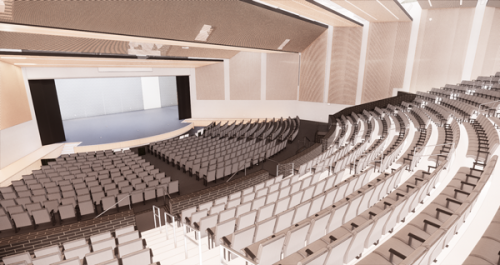 Rendering of new auditorium at Andover High School. 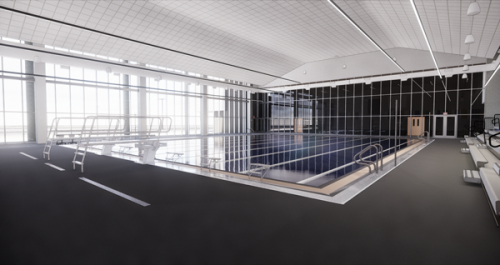 Rendering of new district-wide swimming facility, to be connected to the new Andover High School. Architects have been meeting with staff at Meadowlark Elementary School to finalize designs for the new school, to be located near 159th and 13th streets. Plans call for construction to begin on the new school in April 2019, with a June 2020 completion. Click here to view the latest floorplan of the new Meadowlark Elementary. Work on locker rooms at District Stadium will begin in late December or early January, to be completed by August 2019 for football season. Andover Middle School and Andover Central Middle School tracks will begin in May 2019 and be completed August 2019. Both tracks will be demolished and new tracks will be built with concrete curbs and synthetic track surfaces. AMS tennis courts will be demolished in May 2019 and relocated south of the current location to make way for the new drive behind AHS and AMS. Tennis courts will be complete by August 2019. Finally, planning continues for the new Andover Center for Advanced Professional studies. The program will offer high school juniors and seniors an opportunity to work on real-world projects from businesses, while being mentored by area professionals. Pilot projects for CAPS will begin in fall 2019, with construction of a new facility near 159th and 13th streets complete by fall 2020. CAPS will eventually include strands in aviation, business and entrepreneurship, engineering, information technology, law, marketing, medicine and teacher education, as well as a joint academy with Butler Community College focused on science, engineering and technology.